So here we are! 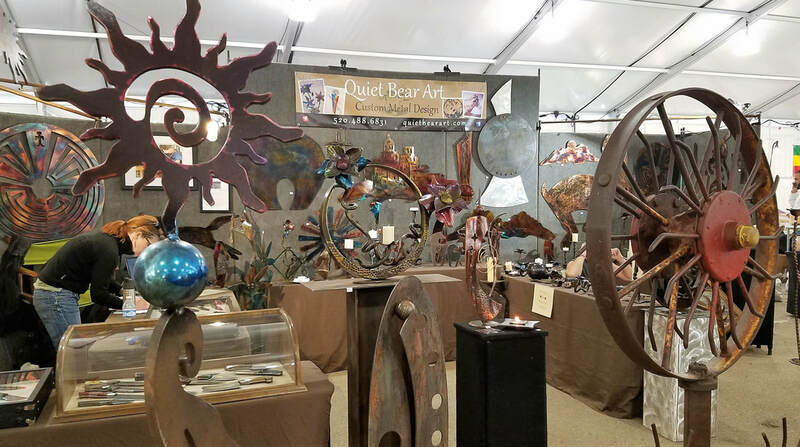 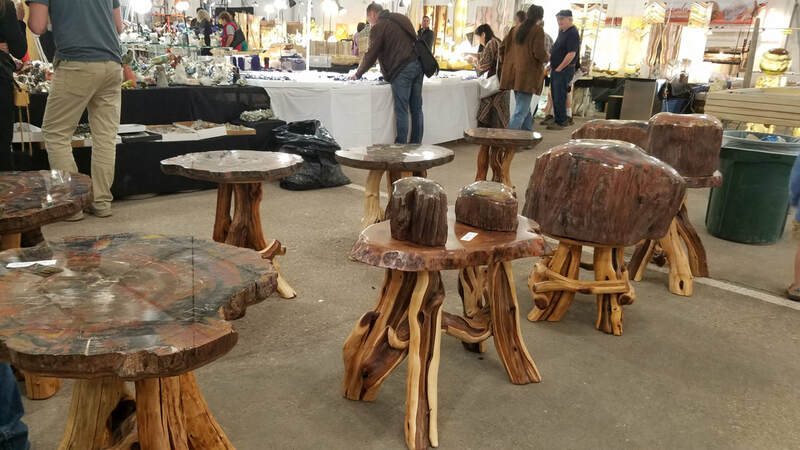 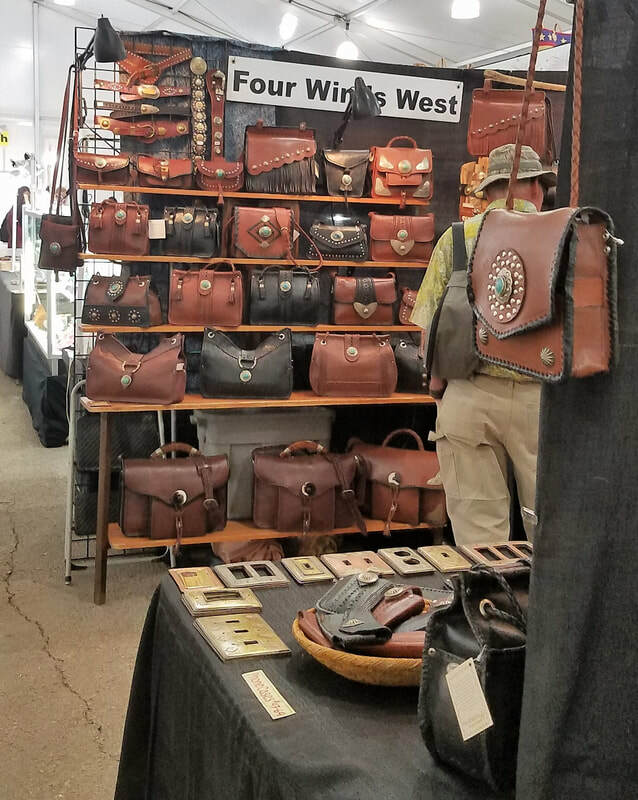 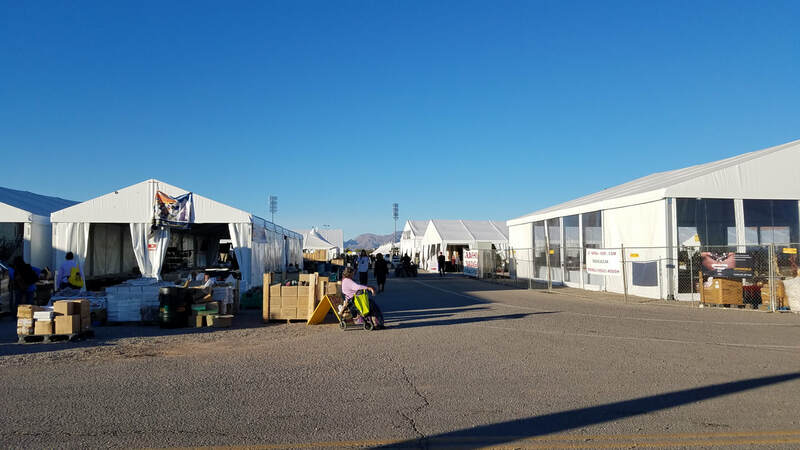 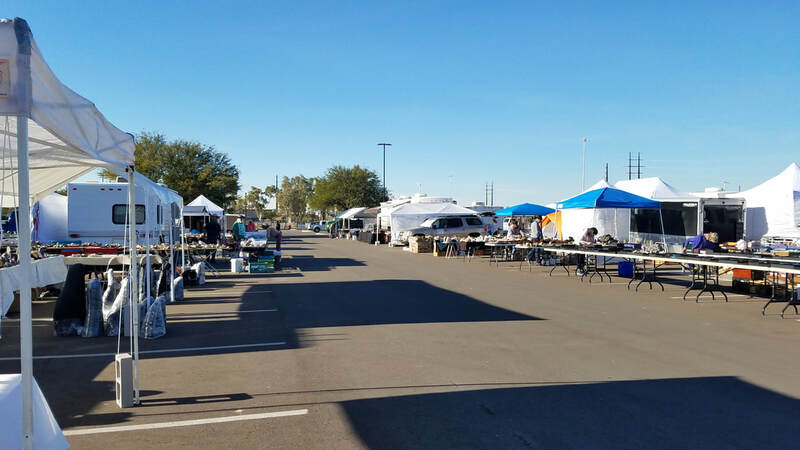 Another year begins at the the International Tucson Shows. 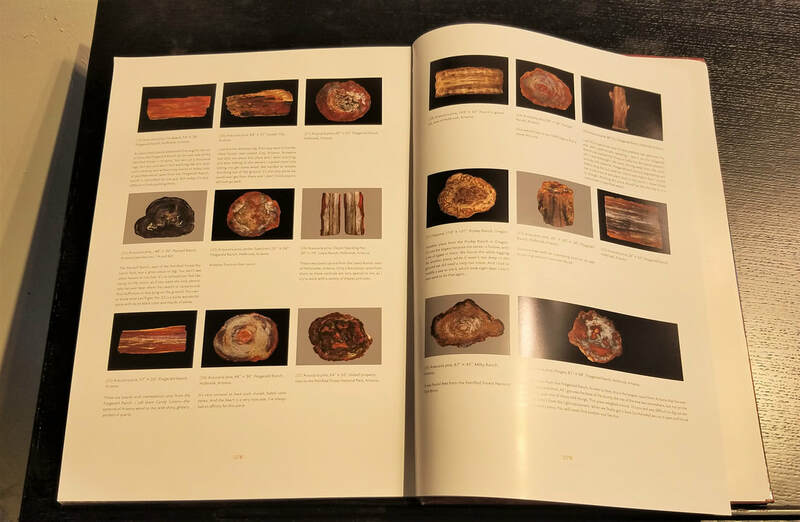 Check out the list below! 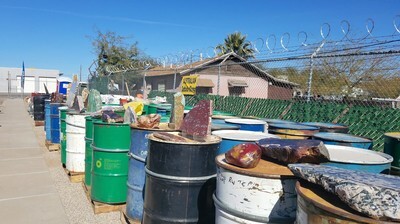 Even the 2.5 weeks we spend in Tucson will not allow enough time to see all of these! But we are trying to do our best. 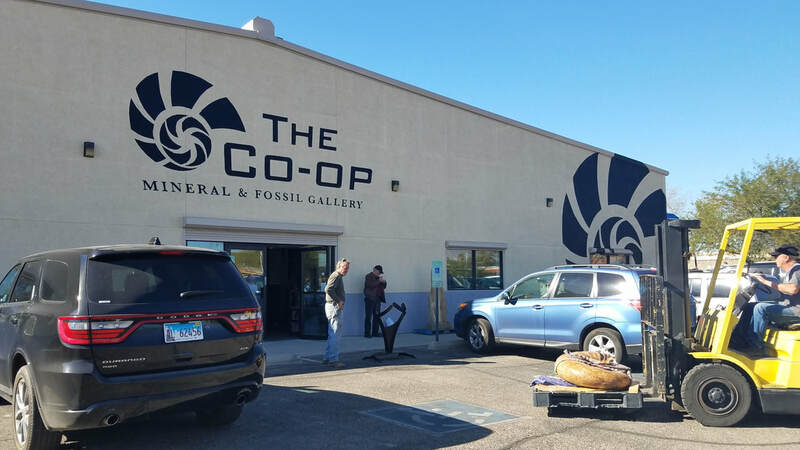 Come along with us during our late January-early February adventure as we share a glimpse of the sights. 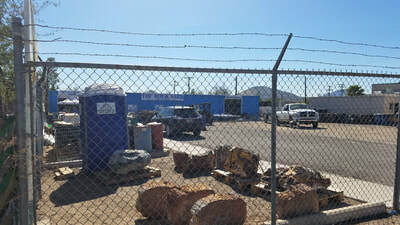 You will have to imagine the rest ... or come to Tucson yourself some day. 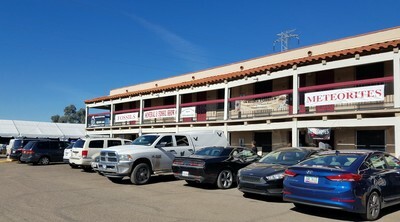 We will meet you here! Oracle Wholesale Show ... about 15 dealers in a "light industrial" complex. 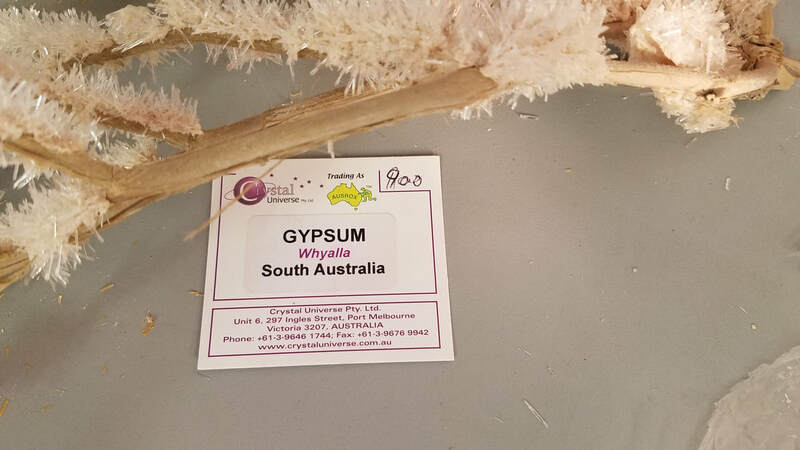 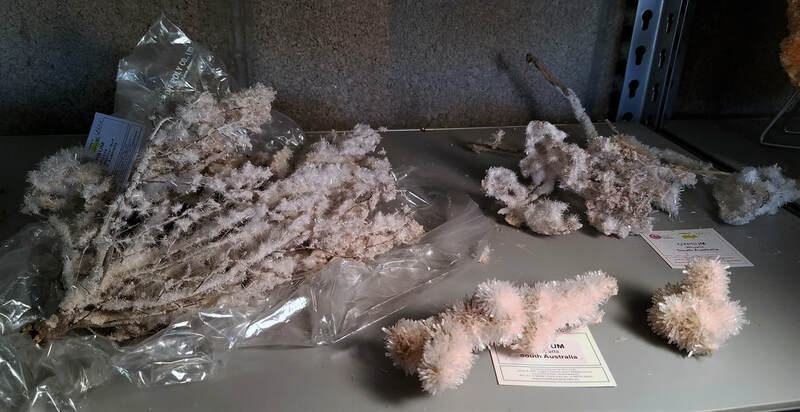 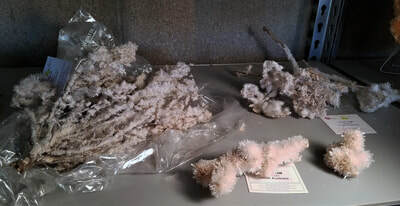 We were impressed by the very delicate gypsum on tree branch specimens from South Australia, harvested from a lake. Even experienced dealers could not get these here without some breakage. 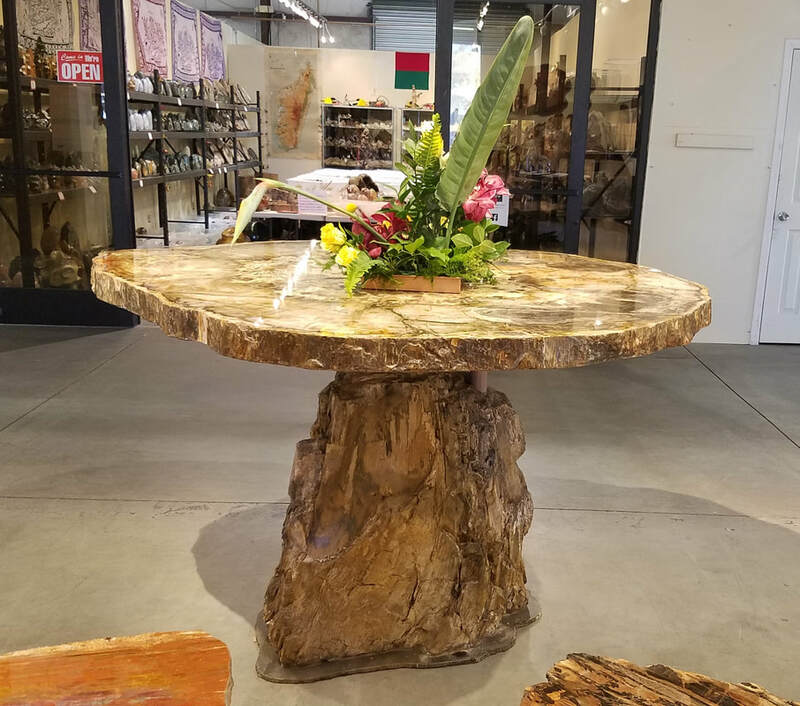 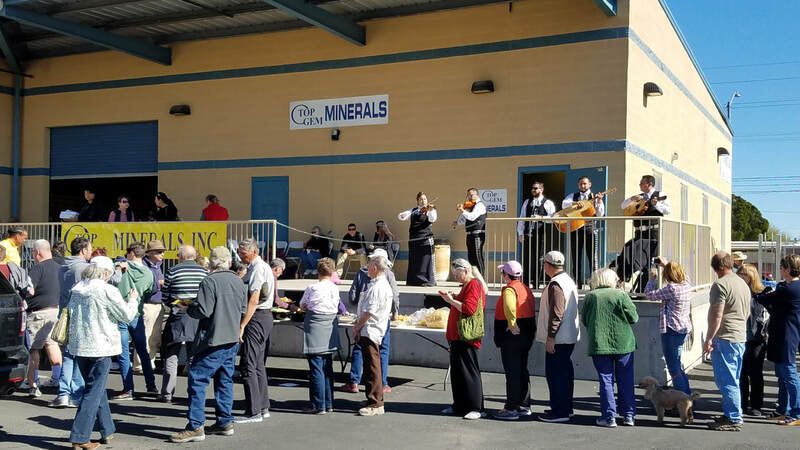 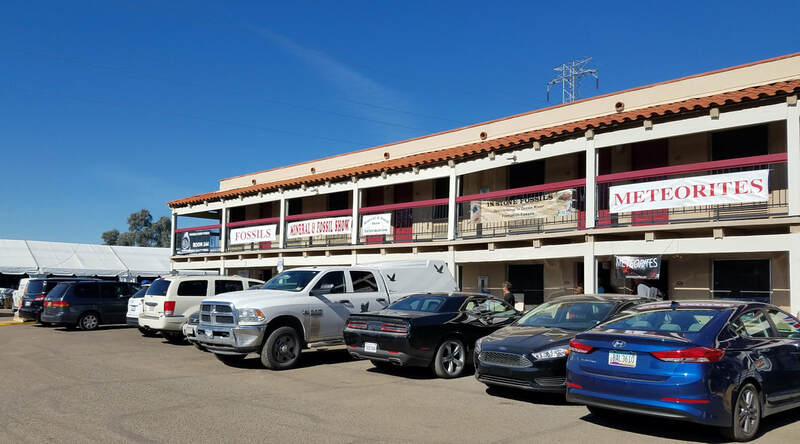 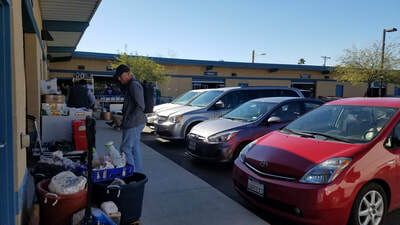 Top Gem Wholesale on Oracle draws a huge crowd for its opener, featuring a fancy mariachi band, Mexican buffet, and (inside) beautiful minerals offered wholesale only to dealers. 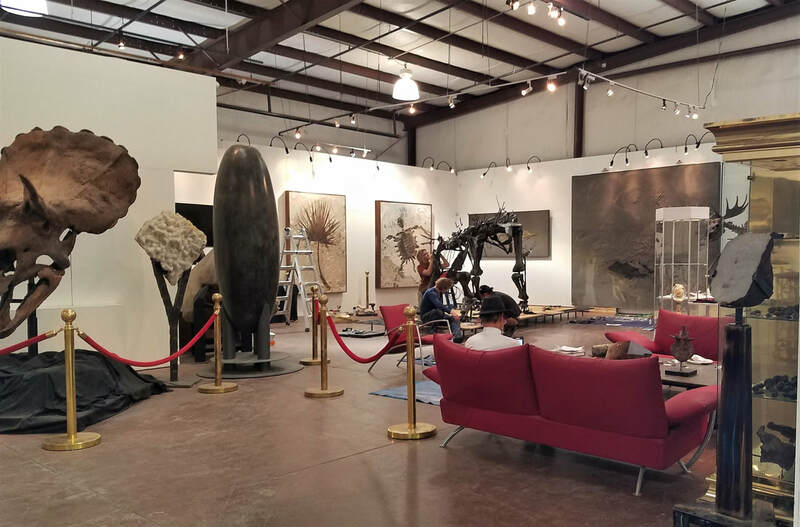 The always-growing 22nd Street Show is quite the venue. This show is housed in a 738' x 100' main hardside "tent" and hosts 238 dealers. 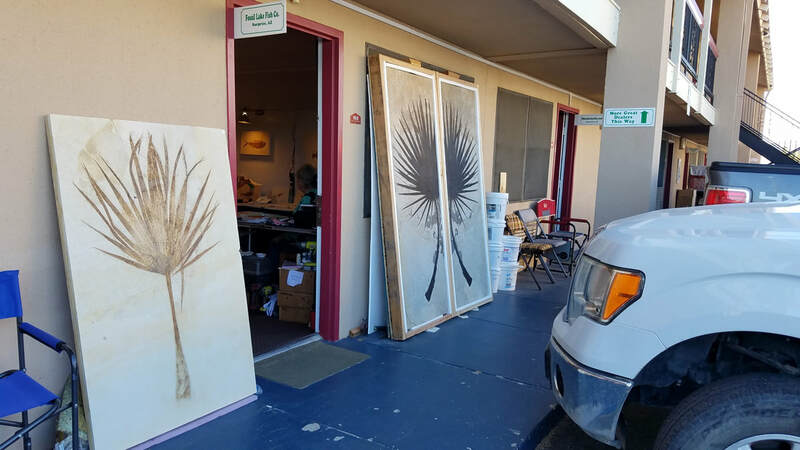 Amazingly, the 22nd Street Show is open from 9:00 to 6:00 for 18 days. 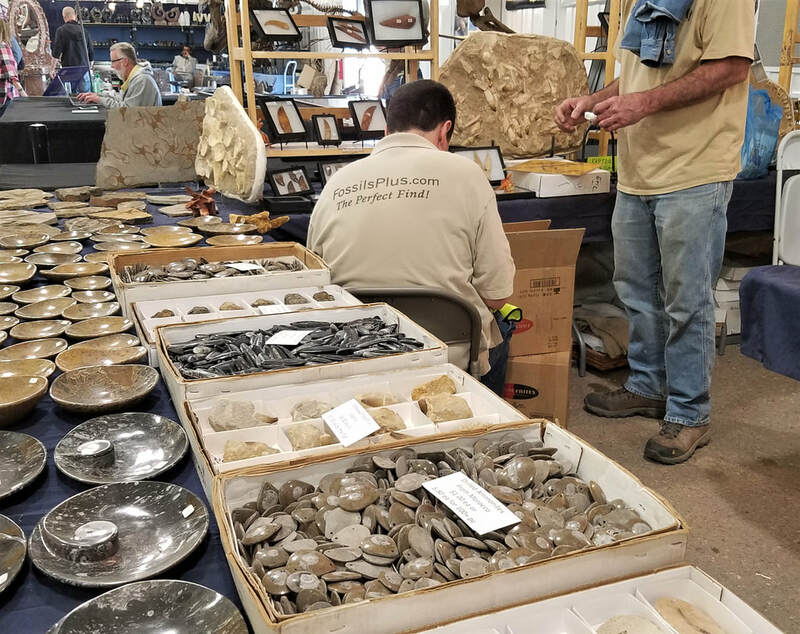 This is a long expensive show for dealers, but gives ample time for collectors and visitors to explore those 268 dealers. 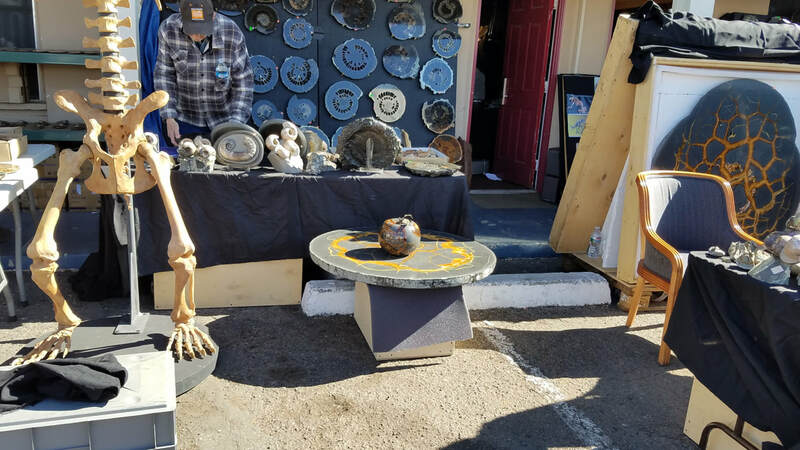 These pictures illustrate, in very small measure, just how much variety exists at the Tucson venues. 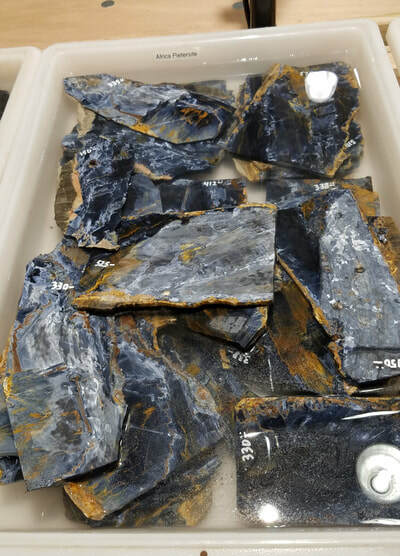 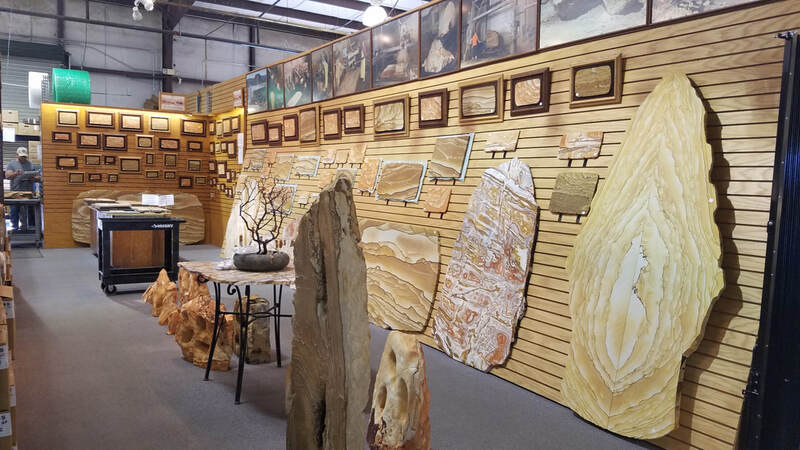 Exquisite lapidary slabs, fascinating fossils, minerals, jewelry, gemstones. 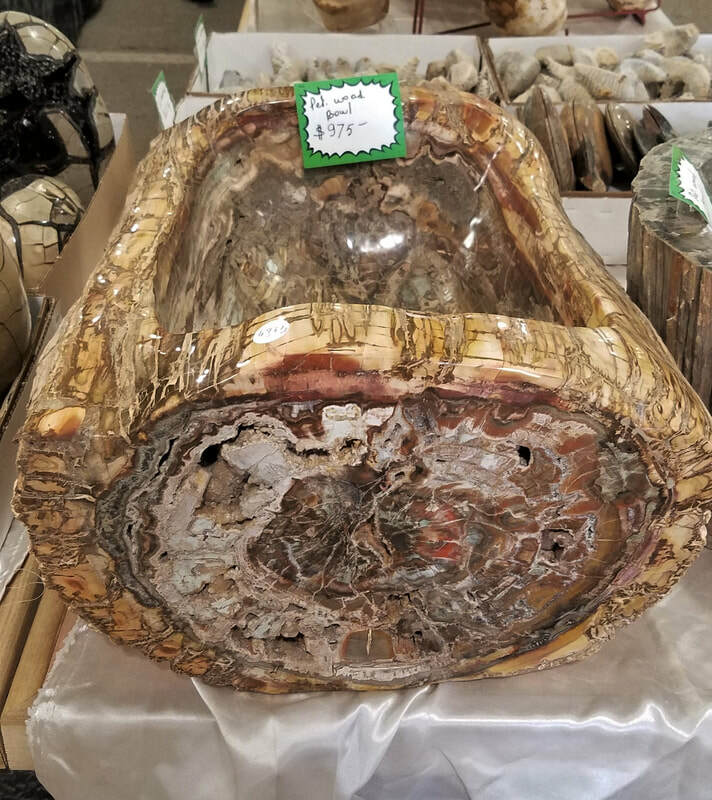 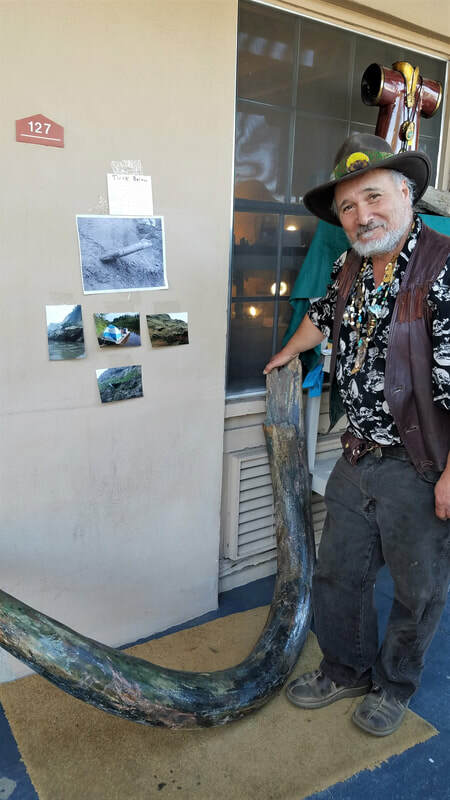 Why, there is even some petrified wood at this locale! 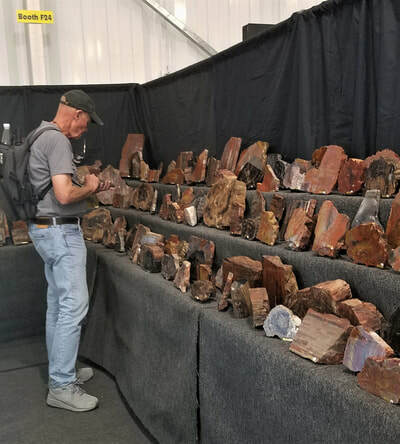 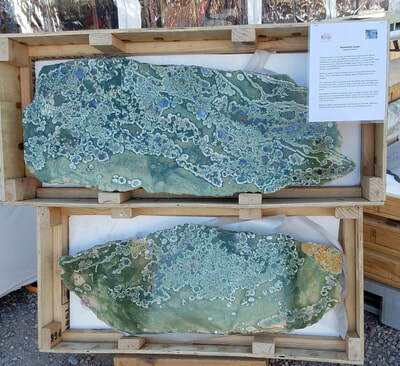 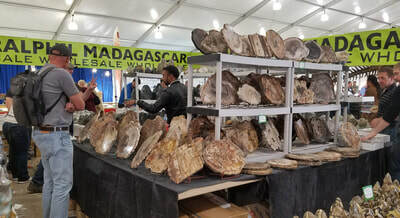 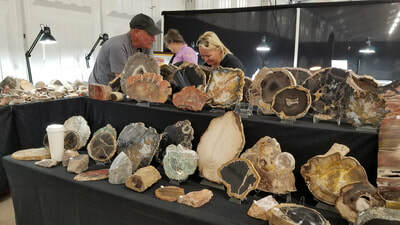 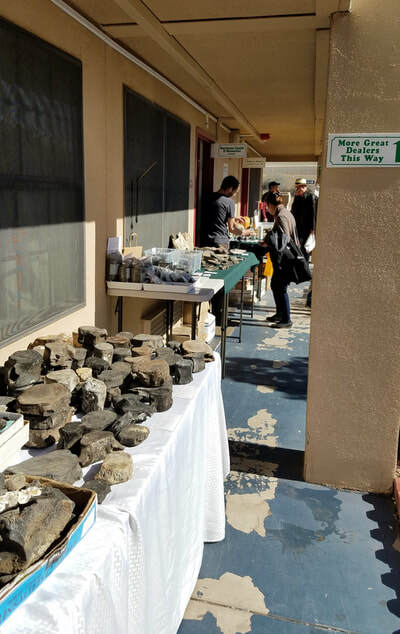 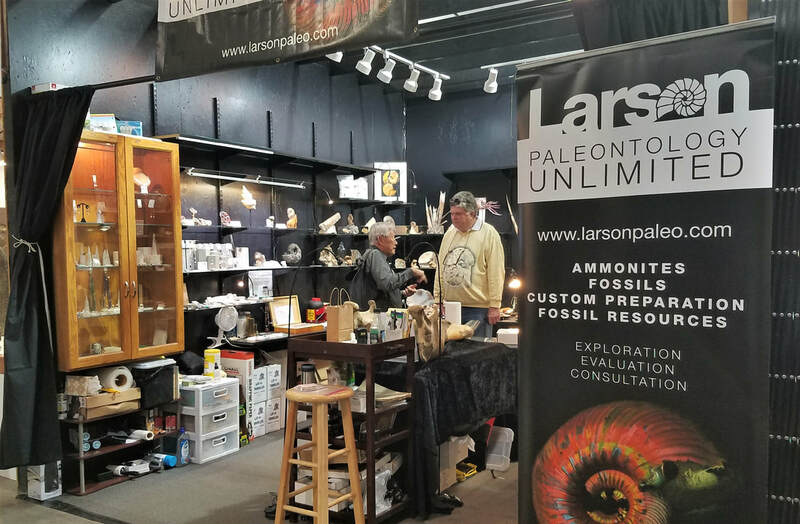 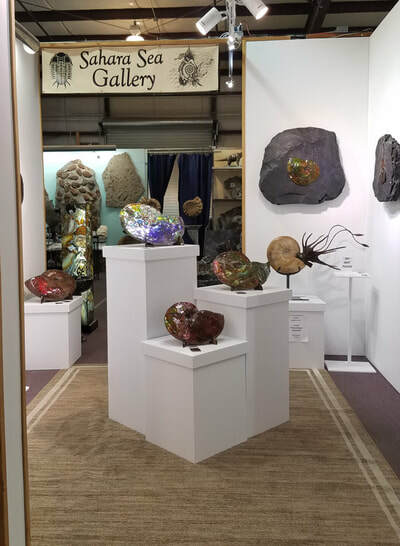 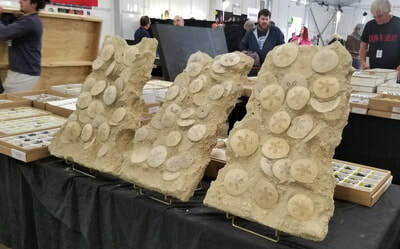 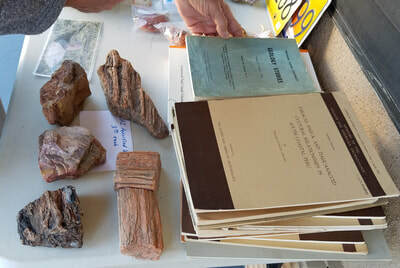 Kino Gem and Mineral Show (formerly known as Tucson Electric Park), is another gigantic outdoor and tent show, featuring everything from dead animal skulls (we spared you the pictures of that this year) to huge lapidary cutting rough, metaphysical crystals and rocks, wholesale rock inventory for gift shops, cutting and polishing equipment, jewelry ... well, just about everything. It's an active place with trucks and forklifts moving around throughout the massive area, requiring some amount of attention to avoid getting run over! 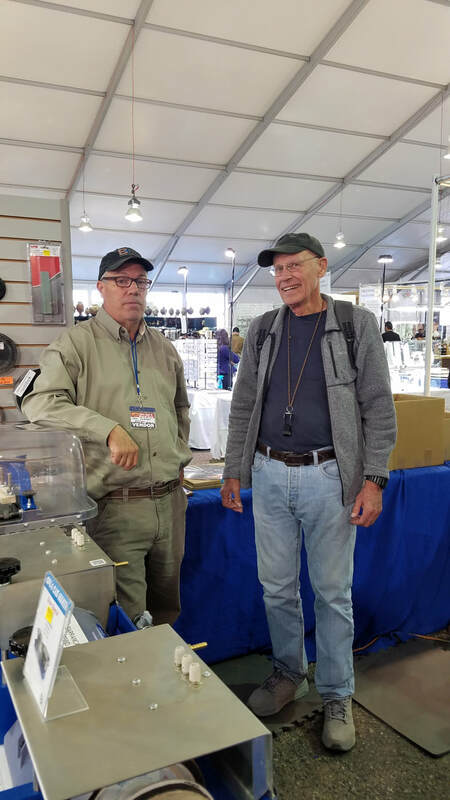 Dean Delahaut of Barranca (shown with Jim) selling polishing machines, blades, bits, and wheels inside one of the huge tents at this venue. 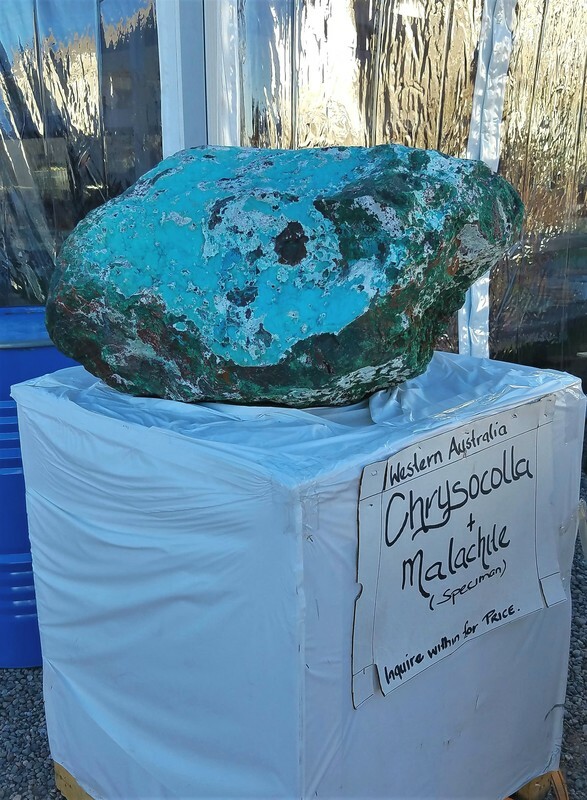 Other friends, Rimrock Gems of Oregon, sell petrified wood, agates, cut stones and cabochons, lapidary material at this show. More pics of this show to follow! Little boy asking about sign on tent: "What does wholesale mean? 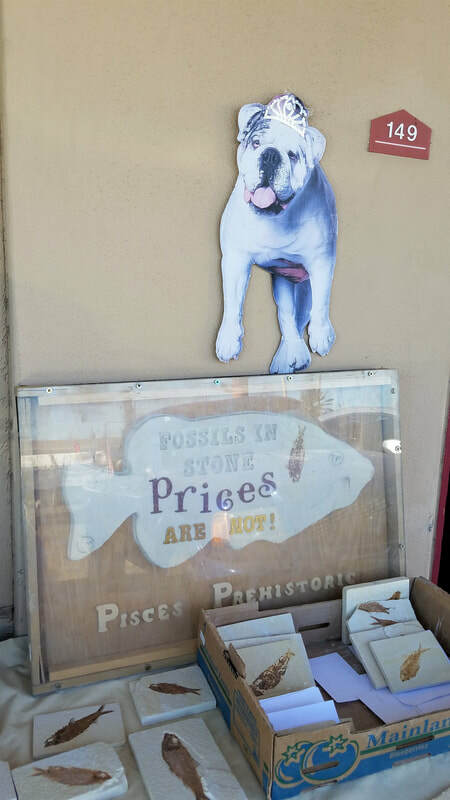 Mom: "It's for people who buy fossils and then sell them to other people." 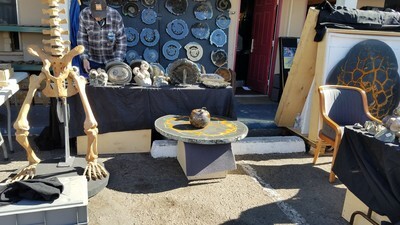 Little boy: "Why would they do that?" 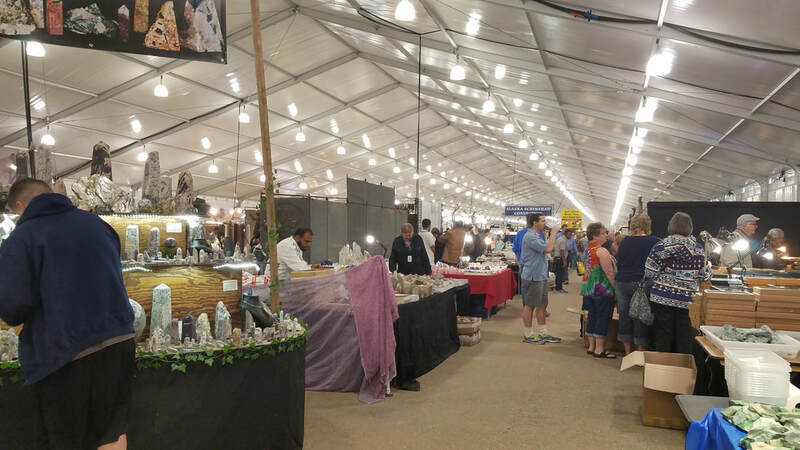 We've visited some shows that get better each year, and then there's the Ramada Ltd. Even the new name of the show, Fossil and Mineral Alley, hasn't changed the place. 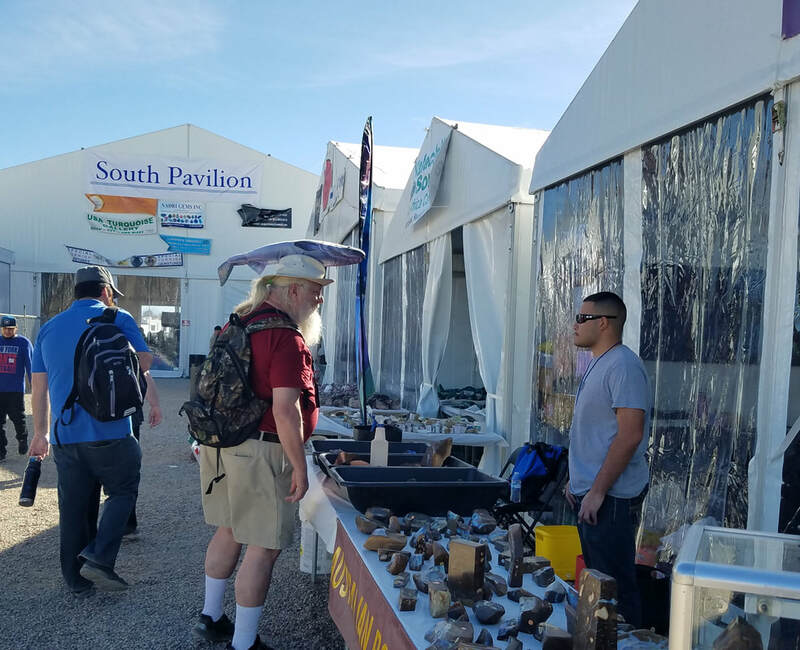 Don't get us wrong, there are some good and reputable dealers here, but the venue is not improving with age. One doesn't come here for the ambiance! 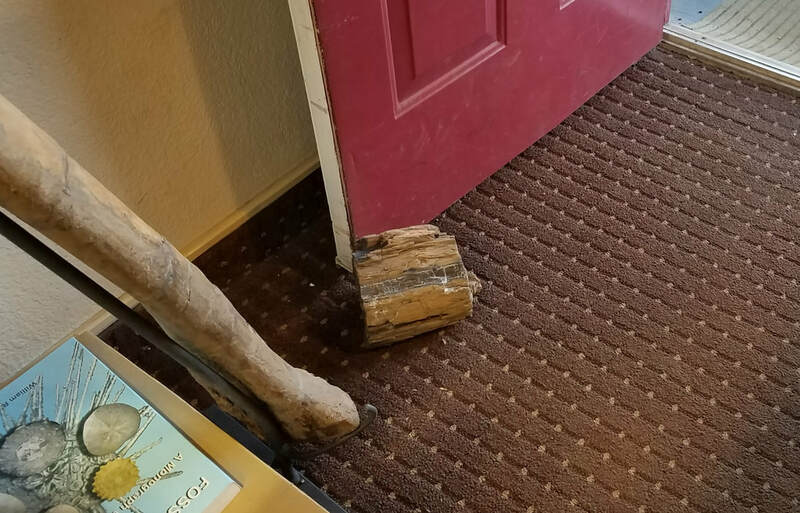 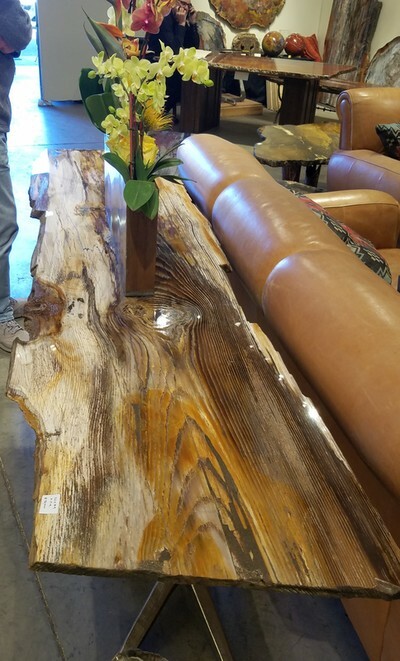 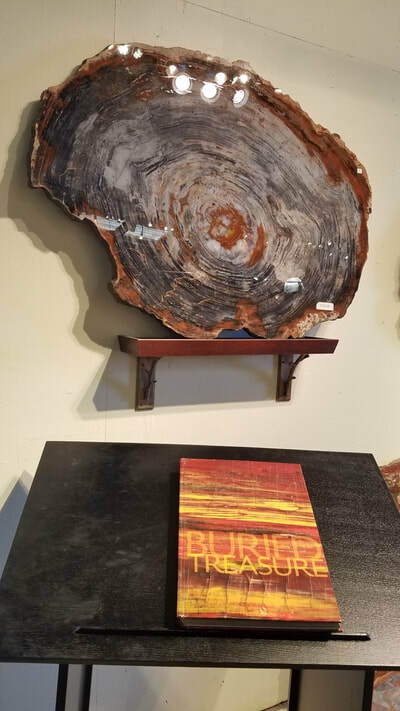 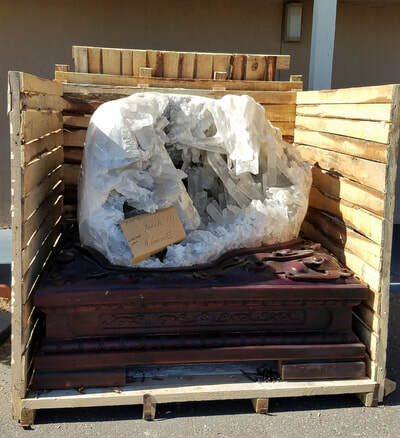 There was little petrified wood (a doorstop for instance) and $3 chunks of Arizona wood. But we combed the show anyway, looking for a surprise! 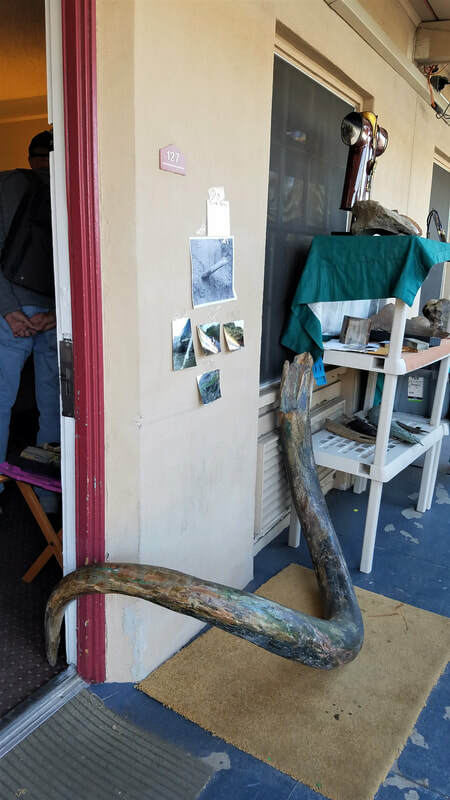 Miles of Alaska is indeed a rockhound with his Alaska garb and proud presentation of his found tusk. 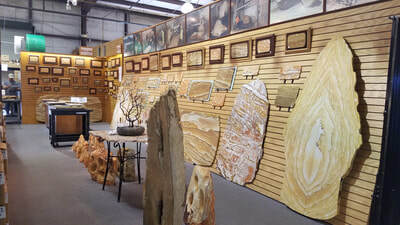 is an expanded location where an Australian friend, Glenn Archer, has located his Outback Mining business. Barrels of rough material here! 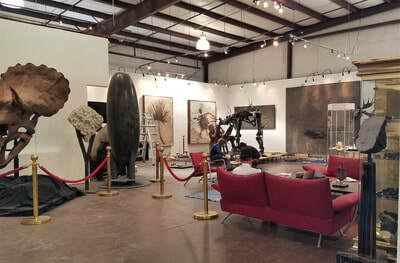 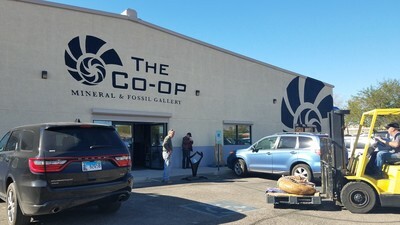 Mineral Coop features quite a few dealers with large and impressive specimens, and fossils as art. 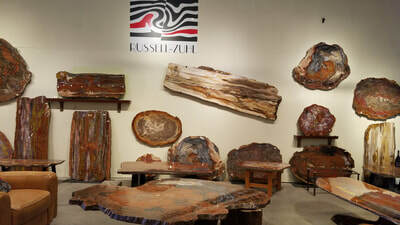 Ralph Thompson of Russell-Zuhl continues to amaze. Check out the size and quality of his gallery this year. 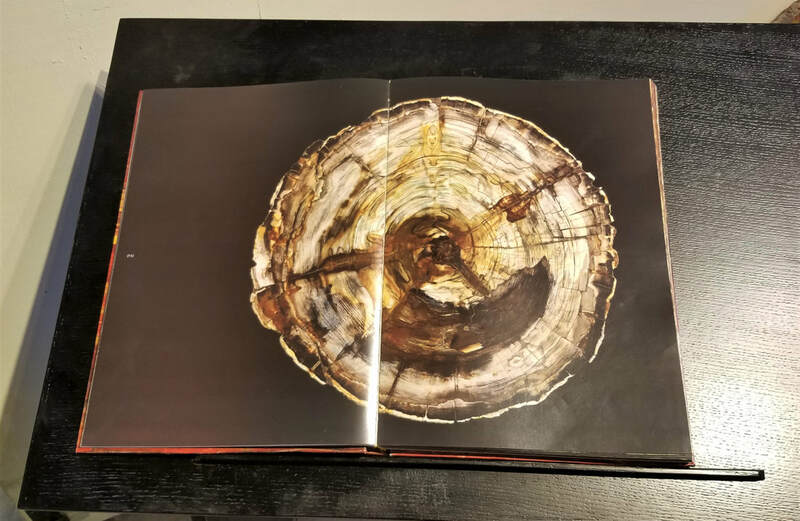 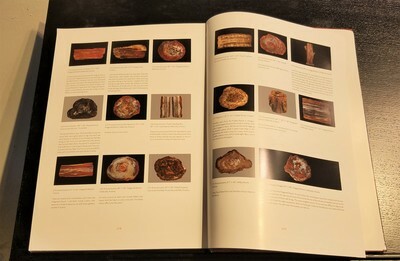 New large format book of the Gillespie Collection. 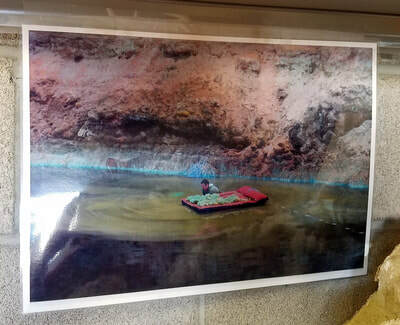 Extraordinary photography! 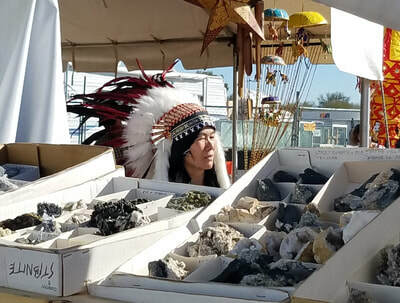 ​And let's be honest, sometimes the most unusual finds are the people at these shows! 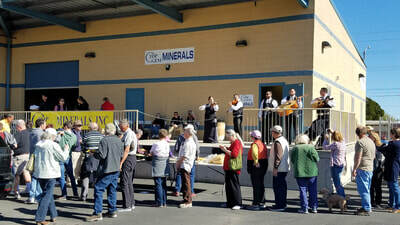 Smokey's Fifth Annual Miner's Coop-Rock Show at Mark Jacobs Sports Park about 12 miles north of downtown Tucson. A good place to shop for rough material, this is an "old-fashioned" outdoor rock sale. Rather out of the way, and difficult to find during the adjacent highway construction, so we're hoping that the dealers do better than they were doing on the day we were here! Weather cannot be blamed. The temperature in Tucson has been 80 degrees F (26.6 degrees C) every day last week -- and it is forecast to stay the same for this week.